The active hormonal form of vitamin D (1,25-dihydroxyvitamin D) is the primary regulator of intestinal calcium absorption efficiency. In vitamin D deficiency, intestinal calcium absorption is low leading to an increased risk of developing negative calcium balance and bone loss. 1,25-dihydroxyvitamin D has been shown to stimulate calcium absorption in experimental animals and in human subjects. However, the molecular details of calcium transport across the enterocyte are not fully defined. Recently, two novel epithelial calcium channels (CaT1/ECaC2 and ECaC1/CaT2) have been cloned and suggested to be important in regulating intestinal calcium absorption. However, to date neither gene has been shown to be regulated by vitamin D status. We have previously shown that 1,25-dihydroxyvitamin stimulates transcellular calcium transport in Caco-2 cells, a human intestinal cell line. In the current study, we have demonstrated that Caco-2 cells express low but detectable levels of CaT1 mRNA in the absence of 1,25-dihydroxyvitamin D treatment. CaT1 mRNA expression is rapidly up regulated (4-fold increase at 4 h and 10-fold at 24 h) by treatment with 1,25-dihydroxyvitamin D (10-7 moles/L). Moreover, the increase in CaT1 mRNA expression preceded by several hours the vitamin D induction of calbindin D9K, a putative cytosolic calcium transport protein. These observations are the first to demonstrate regulation of CaT1 expression by vitamin D and are consistent with a new model of intestinal calcium absorption wherein vitamin D-mediated changes in brush border membrane CaT1 levels could be the primary gatekeeper regulating homeostatic modulation of intestinal calcium absorption efficiency. Low intestinal calcium absorption efficiency in humans is common and contributes to negative calcium balance and bone loss . Recent epidemiological evidence suggests that low fractional calcium absorption is a significant risk factor for future osteoporotic hip fracture . The primary homeostatic mechanism for altering calcium absorption in response to low dietary calcium intake and increased calcium requirements during growth is an increase in plasma 1,25-dihydroxyvitamin D, the active hormonal form of vitamin D produced in the kidney . 1,25-dihydroxyvitamin D is a seco-steroid that acts on gene transcription through a nuclear steroid receptor protein and also may have nongenomic actions mediated by a putative plasma membrane vitamin D receptor . Changes in vitamin D status primarily alter the rate of Ca absorption in the proximal small intestine. During transcellular calcium transport across the absorptive enterocyte, calcium must pass across an apical brush border membrane, then transverse the interior of the cell, and exit against an electrochemical gradient across the basolateral membrane. Changes in the rate of vectorial Ca transport in the intestine however must be accomplished without a major disruption in the free intracellular Ca concentration, which is used as an important intracellular signal in the enterocyte  as in other cells. It has been known for over 30 years that vitamin D status influences the level of calbindin D, a cytosolic calcium-binding protein  believed to be the rate-limiting step in calcium absorption  by acting as an intracellular calcium ferry or chaperone. Calcium extrusion at the basolateral membrane is an active process involving a Ca-ATPase that may also be affected by vitamin D status . However, although it has been known for more than 20 years that the rate of Ca transport across the intestinal brush border membrane can be increased by 1,25-dihydroxyvitamin D , the identity of the calcium transport protein involved in Ca influx has not been ascertained. Recently, two novel, closely related, epithelial calcium channels, CaT1 (also known as ECaC2) and ECaC1 (also known as CaT2), have been cloned from rat  and rabbit  respectively and shown to mediate calcium influx when expressed in Xenopus oocytes. CaT1 and ECaC1 are found in several tissues, including 1,25-dihydroxyvitamin D-responsive epithelia in the intestine and kidney. These epithelial calcium channel genes are products of evolutionary local gene duplication found on chromosome 7 and represent a new family of Ca-selective ion channels involved in active Ca (re)absorption . Furthermore, it has been suggested that the control of the number of active channels at the cell surface is critical for regulation of active calcium transport and that the epithelial calcium channel could confer the rate-limiting step in transcellular calcium transport . Peptide hormones and other cell surface-acting signal molecules trigger increases in the concentration of calcium ions inside the cell by release of calcium from stores within the cell, or activation of Ca++ ion channels in the plasma membrane allowing calcium to enter from outside the cell. One of the most common mechanisms that regulate entry of calcium is by capacitative or store-operated calcium entry . The epithelial Ca-release activated channel, ICRAC, is a highly calcium-selective plasma membrane ion channel that is activated on lowering of either intracellular calcium concentration or intracellular calcium stores. The CaT1 channel has been recently expressed in mammalian CHO cells and patch clamp studies have shown it to have the characteristics of ICRAC. Nearly ubiquitous, store-operated calcium entry is essential in a wide variety of cellular processes including muscle contraction, protein secretion, metabolism, cell differentiation, cell division and apoptosis . Intestinal calcium absorption is increased after feeding a low calcium diet or under conditions of increased calcium needs, such as during growth, via a parathyroid hormone (PTH)-vitamin D mediated process . A lowering of serum calcium levels stimulates the secretion of PTH that then activates the renal conversion of inactive 25-hydroxyvitamin D to the active hormonal metabolite 1,25-dihydroxyvitamin D. At the intestine, 1,25-dihydroxyvitamin D, acting through a nuclear receptor, stimulates transcription of vitamin D-mediated genes, including calbindin D, involved in calcium transport thereby acting as the primary hormonal regulator of active intestinal calcium transport . It is thus likely that any putative key molecular player in calcium absorption, such as CaT1 or ECaC1, should be a prime target for hormonal regulation by 1,25-dihydroxyvitamin D. However, to date, neither CaT1 nor ECaC1 expression has been shown to be related to serum 1,25-dihydroxyvitamin D or vitamin D status [10, 16]. We have developed [17–22] a unique human intestinal cell culture model of vitamin D-mediated transepithelial Ca transport using Caco-2 cells, a colon adenocarcinoma cell line. This cell line spontaneously differentiates in culture and expresses biochemical and morphological characteristics of well-differentiated small intestine-like enterocytes [17, 23]. We have previously shown that Caco-2 cells possess a classical nuclear vitamin D receptor  that directly mediates vitamin D-dependent gene expression , and exhibits a high degree of specificity for various vitamin D metabolites and analogs [20, 21]. Most importantly, in response to short-term (<24 h) 1,25-dihydroxyvitamin D treatment, Caco-2 cells increase transepithelial calcium transport  and calbindin D9K expression , a cytosolic calcium binding protein. Kinetic analysis of Ca transport across Caco-2 monolayers grown on permeable filter supports indicated that 1,25-dihydroxyvitamin D treatment increased the Vmax of Ca transport , which would be consistent with a vitamin D-dependent increase in the number of calcium transporters. In the current paper, we have used the Caco-2 cell culture model to demonstrate that CaT1 mRNA is preferentially expressed in the human enterocyte compared to ECaC1, and for the first time demonstrate that 1,25-dihydroxyvitamin D treatment can cause a rapid and marked increase in CaT1 mRNA expression in the enterocyte. These observations suggest a likely important role for this calcium transporter in vitamin D-dependent calcium absorption. We initially addressed the question of whether Caco-2 cells express ECaC1 or the closely related CaT1 gene. This is important because it has been suggested that because of the high degree of sequence similarity (97%) between the CaT1 and ECaC1 genes care should be taken in interpreting data obtained by hybridization, PCR or other methodologies based on nucleotide sequences . First, the PCR product derived from the putative ECaC1 or CaT1 gene was purified and sequenced. Based on new sequence information (GenBank accession number AF304464 (ECaC1) and AF365927 (CaT1), ) the nucleotides determined following the sequencing of our PCR product from Caco-2 cells was an identical match for CaT1 rather than ECaC1 (data not shown). Second, the sequences of the coding region of the CaT1 and ECaC1 genes (GenBank AF365927 and AF304464) indicate that an additional identification step based on restriction fragment length polymorphism (RFLP) analysis could also be used to confirm the identity of the CaT1 mRNA in Caco-2 cells. As described in the Method section, a 259 bp PCR product was generated with a second set of PCR primers that would specifically encompass a differential Bgl1 restriction enzyme cut site present in CaT1 but not ECaC1. 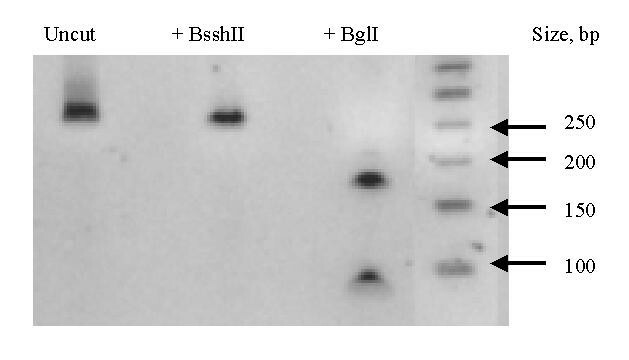 Prior to electrophoresis on a 2% agarose gel, the amplified PCR product was either left untreated, or treated with Bgl1 or BssHII restriction enzymes. There is no predicted BssHII cut site in our amplified region of either CaT1 or ECaC1 based on the recently published sequence of these two genes (GenBank AF365927 and AF304464). Thus, BssHII should serve as negative control for the restriction enzyme digestion step. In contrast, the location of the single BglI cut site in CaT1 should result in the generation of two smaller bands (≅ 180 bp and ≅ 80 bp) if the amplified PCR product was CaT1. Since ECaC1 does not have a predicted BglI site in the amplified PCR product, no smaller bands should result if ECaC1 was being amplified in the PCR reaction. As shown in Figure 1, we found that there were two smaller bands of the predicted size and no larger 259 bp band remaining after Bgl1 digestion, confirming the identity of CaT1 as the product being amplified in Caco-2 cell. In addition, BssHII restriction enzyme digestion did not result in smaller bands, consistent with a likely specific action of Bgl1 digestion of CaT1 under the digestion conditions used. In addition, further attempts at PCR amplification of Caco-2 cell RNA with other PCR primers designed to specifically amplify ECaC1 did not result in an amplified product under our conditions (data not shown). Thus, based on this collective information, we conclude that CaT1, but not ECaC1, is expressed in Caco-2 cells. It needs to be pointed out, however, that since Caco-2 cells are not derived from normal human intestinal tissue, it is possible that ECaC1 could be expressed in the human intestine. However, our observation in Caco-2 cells is consistent with the recent report by Barley and colleagues  indicating a high expression level of CaT1/ECaC2 in human intestine based on Northern blotting, and similar findings by Peng et al. using quantitative real-time PCR for CaT1, who also noted the apparent absence of ECaC1/CaT2 in human intestinal tissue. Restriction Enzyme Digest of PCR Product From Caco-2 Cells. The amplified PCR product for the apical calcium transporter from Caco-2 cells (see text) was digested with Bgl1 or BssHII restriction enzymes. Digestion with Bgl1 resulted in the generation of two smaller appropriately sized products (180 bp and 80 bp) as would be expected only if the PCR product was CaT1 due to the presence of this restriction enzyme cut site only in CaT1 but not ECaC1 in the region amplified (GenBank acc. no. AF365927 nucleotide location 545–803). BssHII digestion did not result in any smaller bands being observed. Thus was expected since this enzyme was not predicted to cut either CaT1 or ECaC1 (GenBank acc. no. AF304464) in the region of interest and thereby could serve as a negative control to exclude the possibility that nonspecific fragmentation of under the restriction digest conditions. Having established the identity of CaT1 in Caco-2 cells, we then studied the effect of 1,25-dihydroxyvitamin D treatment on CaT1 mRNA expression. If CaT1 is an important regulator of intestinal calcium absorption, it is likely that it would be regulated by 1,25-dihydroxyvitamin D. As shown in Figure 2, treatment of cells for 24 h with 10-7 mol/L 1,25-dihydroxyvitamin D caused a 10-fold increase (p < 0.001, ANOVA, n= 10 studies) in CaT1 mRNA expression. To our knowledge, this is the first demonstration in either experimental animals or human tissue that intestinal CaT1 expression is up regulated by 1,25-dihydroxyvitamin D. This finding may provide an important molecular key to understand the mechanism of vitamin D-mediated intestinal calcium absorption. Moreover, given the potentially central role of this epithelial calcium channel as an important modulator of cellular calcium influx in a variety of cell types , it will be of interest to investigate whether the vitamin D effect on CaT1 expression extends beyond the enterocyte. Vitamin D status is known to influence a wide range of physiological systems including cells involved in the immune system, endocrine function, prostate, skin and muscle. Vitamin D effects on CaT1 expression and cellular calcium influx could thereby theoretically modulate intracellular calcium and cell signaling in a variety of different tissues providing insight into understanding the physiological effects of vitamin D throughout the body. Peng and colleagues  have reported that the steroid hormone androgen influences CaT1 mRNA expression in LNCaP prostate cells. We have not yet evaluated the effects of androgens on CaT1 expression in Caco-2 cells. However, we have found (S. Taparia, unpublished studies) that all steroid hormones do not share this effect on CaT1 expression because 17-β estradiol (10 -7 mol/L for 24 h) had no effect on CaT1 mRNA expression in Caco-2 cells. 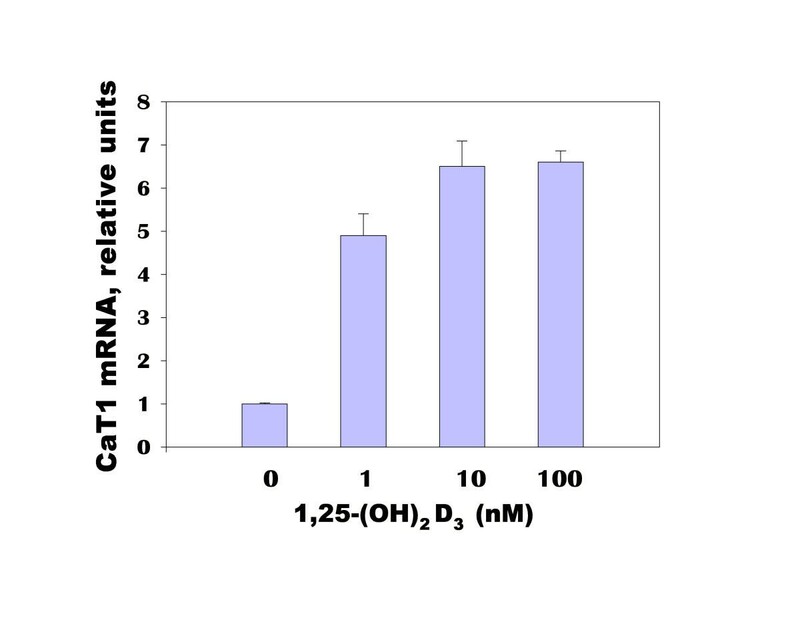 In any case, the demonstrated effect of 1,25-dihydroxyvitamin D on CaT1 mRNA shown here in Caco-2 cells is consistent with the idea that the active metabolite of vitamin D could increase the number of CaT1 calcium transporters in the plasma membrane and could therefore be responsible for the higher rates of calcium influx seen across the brush border membrane in vitamin D-replete animals [9, 27] thereby playing a key gatekeeper role in increasing the efficiency of intestinal calcium absorption and maintaining calcium homeostasis. 1,25-Dihydroxyvitamin D Up Regulates The Expression Of CaT1 mRNA In Caco-2 Cells. Cells were treated with ethanol vehicle or 1,25-dihydroxyvitamin D (100 nM, 10 -7 mol/L) for 24 h. Total RNA was harvested and CaT1 mRNA (28 cycles) and GAPDH mRNA (21 cycles) were determined by RT-PCR. The PCR products were electrophoresed on a 2% agarose gel and stained with ethidium bromide for visualization and digital capture. The upper picture in the illustration shows the CaT1 PCR products from 6 individual wells of a single experiment (3 control and 3 + 1,25-dihydroxyvitamin D). CaT1 expression in the gel has been juxtaposed on top of the corresponding GAPDH expression. GAPDH is a housekeeping gene used to standardize CaT1 mRNA expression. Low levels of CaT1 mRNA are discernable in the absence of vitamin D treatment and the up regulating effect of 1,25-dihydroxyvitamin D by 24 h of treatment is clearly evident. The bar graph shows the combined mean (SEM) effect of 1,25-dihydroxyvitamin D on CaT1 expression normalized for GAPDH from 10 independent studies. 1,25-dihydroxyvitamin D treatment caused a significant (p < 0.001) 10-fold increase in CaT1 mRNA expression compared to vehicle treated control cells. In another series of studies, we addressed the temporal and dose-response effect of 1,25-dihydroxyvitamin D on CaT1 mRNA expression in Caco-2 cells. As shown in Figure 3, the response of CaT1 mRNA to 1,25-dihydroxyvitamin D is rapid (n = 6 studies). Treatment with 10-7 mol/L 1,25-dihydroxyvitamin D increased (~2-fold) CaT1 mRNA by 2 h, the earliest time point investigated, and clearly elevated CaT1 expression by 5-fold at 4 h, with progressively higher expression (up to 14-fold) at the later time points. Early Temporal Response of CaT1 mRNA to 1,25-dihydroxyvitamin D in Caco-2 Cells. 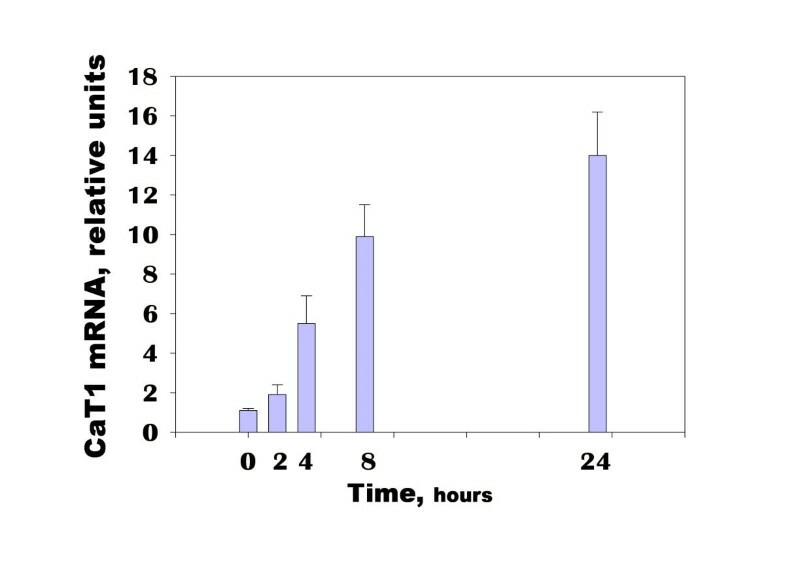 Caco-2 cells were treated with 1,25-dihydroxyvitamin D (10 -7 mol/L) for 0, 2, 4, 8 or 24 h. The bar graph illustrates the mean (SEM) fold-increase in CaT1 mRNA expression at each of the time points from 6 independent time course studies. There was a significant (p < 0.0001, ANOVA) time-dependent induction of CaT1 mRNA expression by 1,25-dihydroxyvitamin D with evidence of increased induction as early as 2 h and clear and progressive up regulation of CaT1 expression between 4 h and 24 h.
The relationship between the dose of 1,25-dihydroxyvitamin D treatment and CaT1 mRNA response was investigated in a third set (n= 3 studies) of experiments at 10-9, 10-8, and 10-7 mol/L 1,25-dihydroxyvitamin D for 24 h. In these studies there was a significant increase in CaT1 mRNA levels at the lowest dose (10-9 mol/L) of 1,25-dihydroxyvitamin D studied (Figure 4), while a slightly higher level of CaT1 mRNA expression was observed at 10 -8 mol/L 1,25-dihydroxyvitamin D, no further effect on CaT1 mRNA was seen with another 10-fold increase in 1,25-dihydroxyvitamin D concentration. Effect of 1,25-dihydroxyvitamin D Dose on CaT1 mRNA in Caco-2 cells. Cells were treated for 24 h with increasing doses (1–100 nM) of 1,25-dihydroxyvitamin D. The mean effect of 1,25-dihydroxyvitamin D (n= 3 studies) on CaT1 mRNA was evident at the lowest dose (10 -9 mol/L) investigated. In these experiments there was a further increase in expression at 10 -8 mol/L 1,25-dihydroxyvitamin D, but no further increase in expression at a 10-fold higher dose of 1,25-dihydroxyvitamin D.
The rapid time course of induction and sensitivity of CaT1 mRNA response to 1,25-dihydroxyvitamin D treatment supports the idea that CaT1 could play a role as a gatekeeper of intestinal calcium absorption. We have previously reported that it takes from 12–16 h following 1,25-dihydroxyvitamin D treatment of Caco-2 cells to first appreciate an increase in saturable transcellular calcium transport . This temporal response is similar to the 8–16 h observed for the achievement of maximal rates of intestinal calcium absorption in vivo following 1,25-dihydroxyvitamin D treatment of vitamin D-deficient chickens . Future studies of the time course of CaT1 protein expression and localization of this protein to the brush border will be necessary to confirm this point, but must await the development of a suitable CaT1 antibody. It has been argued  that the cytosolic vitamin D-dependent calcium binding protein calbindin D9K is the likely rate-limiting step in vitamin D-induced intestinal calcium absorption. However, despite a considerable amount of associative evidence , there has long been some controversy on this issue [29–31] because of apparent discrepancies in the temporal pattern of calbindin D9k induction compared to calcium absorption following 1,25-dihydroxyvitamin D treatment in experimental animals. Thus, in the current study, to evaluate a possible gatekeeper role for CaT1 in vitamin D-mediated calcium transport we compared the time course of 1,25-dihydroxyvitamin D induction of calbindin D9k mRNA and CaT1 mRNA in Caco-2 cells. In Caco-2 cells, the mRNA for both calbindin D and CaT1 can be detected by PCR in the absence of vitamin D treatment. The concentration of 1,25-dihydroxyvitamin D in the basal cell culture medium is approximately 10 -12 mol/L. As illustrated in Figure 5, the time course of vitamin D-dependent mRNA induction of the two genes clearly differs with CaT1 expression responding much earlier than calbindin D9k. There is no evident induction of calbindin D mRNA by 1,25-dihydroxyvitamin D in Caco-2 cells up to 8 h post treatment. 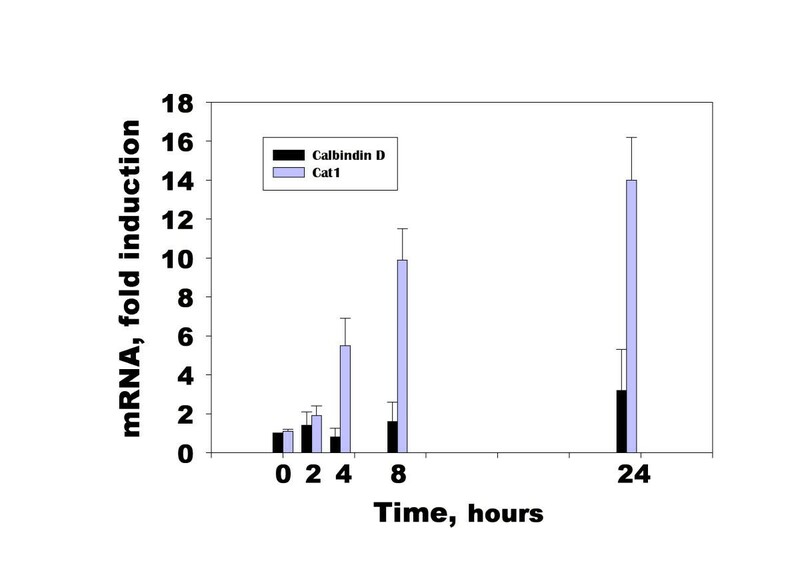 In these experiments calbindin D mRNA was 3-fold greater than control by 24 h. In contrast, CaT1 mRNA was clearly increased (>5-fold) by 4 h post 1,25-dihydroxyvitamin D treatment in the same cells. These observations will need to be expanded in the future to include measurement of the relevant proteins. However, such association studies will not completely settle the question of the relative importance of either of these vitamin D-induced genes in the calcium transport response to 1,25-dihydroxyvitamin D. Those questions will be likely answered more directly in the future by individually altering the expression of these calcium transport genes in transfected cell lines or in transgenic animal models. Comparison of the Time Course of CaT1 mRNA and Calbindin D 9K mRNA Induction by 1,25-dihydroxyvitamin D in Caco-2 Cells. Caco-2 cells were treated with 1,25-dihydroxyvitamin D (10 -7 mol/L) for 0, 2, 4, 8 or 24 h. The bar graph indicates the mean (SEM) fold-increase in CaT1 mRNA and calbindin D mRNA expression at each of the time points. The early induction of CaT1 mRNA by 4 h and 8 h following 1,25-dihydroxyvitamin D treatment is not evident for calbindin D mRNA, which did not increase above control until the 24 h time point. The data for CaT1 is the same as presented in Figure 3. Given what is already known about the characteristics of the epithelial calcium channels and calbindin D, it is a plausible hypothesis that CaT1 and calbindin D could work in tandem to maintain high rates of calcium absorption. Studies in human duodenal biopsy specimens have found a significant correlation between CaT1 mRNA and calbindin D mRNA expression . Thus, as a working hypothesis, we propose that during times of dietary calcium stress, or during periods of high calcium demand, CaT1 expression in the enterocyte is increased by a vitamin D-dependent mechanism. This regulatory genomic response of the enterocyte would result in an increase in the brush border membrane content of CaT1 calcium influx channels that could function as a gatekeeper mechanism to augment the rate of calcium entry across the apical membrane . However, given that there is a Ca-dependent negative feedback mechanism to limit calcium entry through the channel by maintaining the channel in the closed position [14, 15] there must be a way to remove calcium from the vicinity of the cytosolic face of the channel to optimize and sustain calcium influx rates. The coordinated vitamin D-dependent induction of the cytosolic calcium-binding protein calbindin D could serve this function when the need for transcellular calcium flux is high by acting directly or indirectly as a molecular sponge and selectively removing calcium ions from the CaT1 channel and/or to buffer increases in intracellular calcium, thereby preventing premature inactivation of this ICRAC channel . Calbindin D could also play its traditionally conceived role as a calcium chaperone protein to facilitate the transfer of calcium through the cytosol  and perhaps delivery of Ca++ to the basolateral ATP-dependent calcium pump for extrusion out of the enterocyte . These observations are the first to demonstrate regulation of CaT1 expression by 1,25-dihydroxyvitamin D in the human enterocyte and are consistent with a new model of intestinal calcium absorption wherein vitamin D-mediated changes in brush border membrane CaT1 levels could be the primary gatekeeper regulating homeostatic modulation of intestinal calcium absorption efficiency. Caco-2 cells (HTB 37, ATCC, Rockville, MD) were propagated and maintained as described previously . Caco-2 cells were studied between passages 30–40. Cells were seeded into six-well dishes (35-mm diameter; Costar, Cambridge, MA) and grown for 15 days. Cell culture medium, nutrients and antibiotics were purchased from BioWhittaker (Walkersville, MD). FBS was purchased from HyClone Laboratories (Logan, Utah). Chemicals were purchased from Sigma Chemical Co. (St. Louis, MO) and 1,25-dihydroxyvitamin D was purchased from Biomol Research Laboratories (Plymouth Meeting, PA). In time-course studies, cells were treated with 100 nanomol/L 1,25-dihydroxyvitamin D diluted in DMEM + 5% FBS for 0, 2 h, 4 h, 8 h and 24 h. All treatments ended at the 24 h time point. Control treatments were treated with ethanol vehicle alone. In dose-response studies, cells were treated for 24 h with 0,1,10, or 100 nanomol/L 1,25-dihydroxyvitamin D diluted in DMEM + 5% FBS. Control cells were treated with ethanol vehicle. Following experimental treatments, cells were harvested and total RNA was isolated according to manufacturer's instructions (Tri Reagent, Molecular Research Center, Cincinnati, OH). One microgram of total RNA was made into a cDNA library by a reverse transcription process using the following conditions: 0.1 ug of oligothymidine, 100 U of reverse transcriptase, 5 ug bovine serum albumin (BSA), 10 U RNAsin (Promega, Madison WI) in a final volume of 10 ul buffer containing 50 mM Tris-HCl (pH 8.3), 75 mM KCl, 3 mM MgCl2, 10 mM dithiothreitol, 0.5 mM each of CTP, ATP, GTP, TTP, incubated for 2 h at 37°C, and denatured at 95°C for 10 minutes. The cDNA solution containing 0.1 μg equivalent RNA was analyzed by PCR for GAPDH, human calbindin D9K, and human CaT/ECaC. Primers sets for the epithelial calcium channel were as follows: sense primer 5'TGAACCTGGTGCGCGCACTGC3' (GenBank accession number AJ271207.1 nucleotides 480–500) and antisense primer 5'CCCAGGGAGTCCTGGGCCCGGA3' (nucleotides 657–678). The PCR primers used for GAPDH and calbindin D were as previously described . PCR conditions used were: denature at 94°C for 40 s, annealing at 55°C for 50 s with an extension at 72°C for 50 s. All reactions were run within the linear range of number of cycles to product formed. GAPDH was amplified for 21 cycles, CaT1 for 28 cycles and calbindin D9K for 28 cycles. A blank PCR was run using water for each gene tested. PCR products were electrophoresed on a 2% agarose gel containing ethidium bromide. Relative amounts of amplified PCR product from each experimental condition were visualized under ultraviolet light and digitized with the Gel Doc 2000 gel documentation system (Bio-Rad Laboratories, Hercules, CA). Relative amounts of product were estimated by digital densitometry using Quantity One (version 4) quantitation software (Bio-Rad). 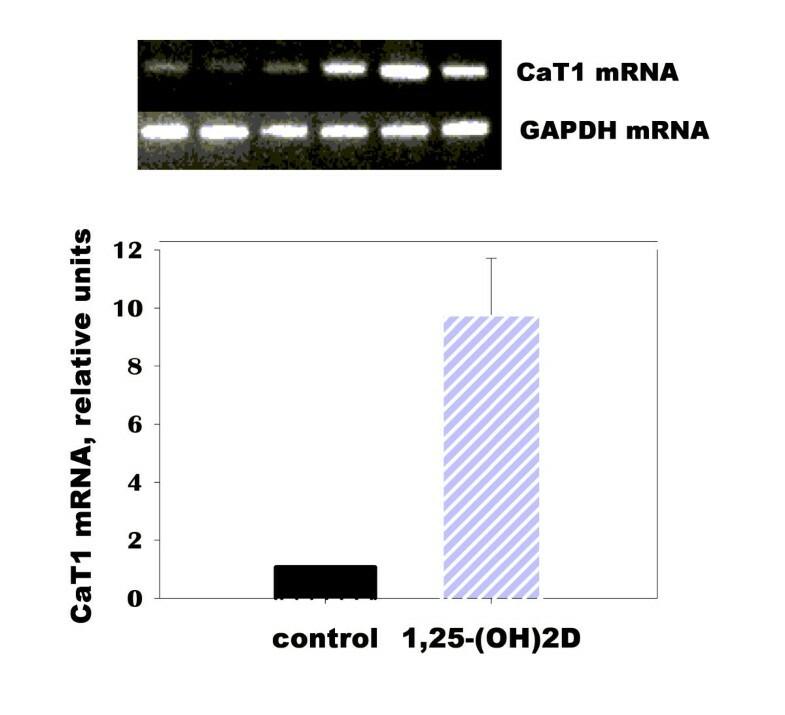 CaT1 and calbindin D9K mRNA expression were normalized relative to the expression of GAPDH mRNA, a constitutively expressed gene whose levels were not affected by 1,25-dihydroxyvitamin D treatment. PCR products from the epithelial calcium channel were generated with the primers described above, subjected to electrophoresis on a 1% low-melting-point agarose gel, and purified for sequence verification. The DNA sequencing facility at Tufts University sequenced the PCR product to identify whether the amplified PCR product from Caco-2 cells was either CaT1 or the closely related ECaC1 sequence. Because of the high nucleotide similarity of CaT1 and ECaC1 (97%), an additional identification step based on restriction fragment length polymorphism (RFLP) analysis was also conducted to confirm the identity of CaT1 in Caco-2 cells. PCR products were generated using the following primer set: sense primer (5'TGACATCTGAGCTCTATGAGGGT3', GenBank AF365927 nucleotides 545–567) and antisense primer 5'CCCAGGGAGTCCTGGGCCCGGA3' (nucleotides 782–803). These primers yield a 259 bp PCR product with a specific restriction site that makes it possible to clearly distinguish between CaT1 and ECaC1 using the restriction enzymes Bgl1 (New England Biolabs). In this PCR amplified product, there is no predicted Bgl1 restriction enzyme site in the corresponding ECaC1 sequence. In contrast, the presence of this Bgl1 cut site in the CaT1 sequence will result in two smaller bands (≅ 180 and ≅ 80 bp) after digestion with the endonuclease. The endonuclease digested and undigested PCR samples were electrophoresed on a 2% agarose gel and the bands were visualized with ethidium bromide staining. The size of the cut bands was estimated with standard 50 pb markers to identify whether the PCR product amplified from Caco-2 cells was being cut into the appropriately sized bands with Bgl1. Data are reported as mean ± the standard error of the mean (SEM). Experiments were repeated from 3 to 10 times. Treatment effects were evaluated by ANOVA with a post hoc Tukey test for individual treatment comparisons (SYSTAT version 9, SAS Institute, Cary NC) where applicable. This work was supported from funds from the United States Department of Agriculture, Agricultural Research Service cooperative agreement 1950-51520-006-00D. The contents of the publication do not necessarily reflect the views or policies of the US Department of Agriculture, nor does mention of trade names, commercial products, or organizations imply endorsement by the US government. Some of the data presented here were reported in preliminary form at the annual meeting of the federation of American Societies for Experimental Biology (Experimental Biology 2001) in Orlando FL (FASEB J 2001; 15: A59).